Location, location location! Perfectly situated only 3 miles (a 5-7 minute drive) from the charming and historic Healdsburg Plaza, this fabulous, custom three-bedroom home abounds with special eco-friendly features. You will be wowed by this modern home’s beautiful open-beamed cathedral ceiling, wall-to-wall windows and multiple full-glass, oversized French doors that let the beauty of Mother Nature inside. With vineyards all around, a short drive down a tree-lined, country lane, delivers you to this tranquil wine country home. The beautiful new, in-ground salt water pool/spa with electric, lockable cover is solar heated, and the spa is gas heated. The partially covered front porch is a tranquil gathering place that looks out over the pool and new bocce ball court on the side. Furnished with a large teak dining table and chairs for six, four beautiful chaise lounges for the ‘sun worshipers’ and a comfy new full-sized outdoor sofa with two chairs, coffee table, and end table, this entertainment space is especially serene. Please note that this is not a “party house.” The setting is peaceful and bucolic, and we require that all guests respect the serenity of the area and our neighbors’ expectation of peace and quiet. We strictly enforce not just the Sonoma County Vacation Ordinance rules, also the special, including limiting the number of guests and cars that may be on the property at any time. No more than 4 cars may be on the property. No more than 6 adults may occupy the property. Quiet time starts, and outside activities must end, at 9:30 P.M. This Wine Country ‘chateau’ is a heavenly home away from home with vineyards all around. 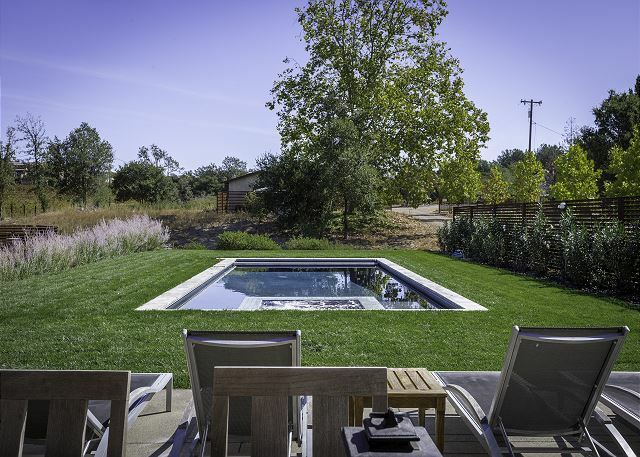 Just south of the Healdsburg square, this property offers a tranquil and serene ‘home base’ for soaking up the beauty of Mother Nature, enjoying a dip in the salt water pool and/or spa, playing a little bocce ball, or making yourself a fine feast. When you leave the property, please explore and enjoy the diversity of Sonoma County Wine Country, with more than 100 wineries, outstanding restaurants, Russian River, Sonoma Coast, and many more attractions and adventures in the ‘Tuscany’ of northern California; you will likely need at least a week to relax and feel the joy! Please keep in mind that this is a Pet Free home. We were a group of 6 women for a long weekend and enjoyed the house immensely. The decor, landscape and layout were perfect. There was enough space for everyone and the house was extremely private. Would come again! Thank you for choosing to stay with us! We hope that you will get the chance to stay with us again! Our first and continued remarks were WOW! Our families totally enjoyed each and every moment on the property. The house was beautifully decorated...well stocked and a pleasure to work together. The pool and spa were a God send and spent many happy hours outdoors. Bocci was a winner too. What was really enjoyable was the rules were there,but not so stringent that we were nervous. Paradise filled with laughter,good times and family. Great house and location. House was functional and had a good layout. Area was very quite and peaceful. We enjoyed our stay and would love to come back. However, we felt the house had too many instructions to follow. From the master shower tile to AC to Grill to septic, etc. Folks that can afford to stay here are not going to squeegee the tile in the master shower and should generally keep the house well maintained for you. Lastly, we did call a few times prior to our arrival and we did not receive a return call. Limerick Lane is an absolutely beautiful property, and it was perfect for our stay in Healdsburg. The layout was perfect for our family, and the house also had some toys that the kids loved. The house was well stocked and had everything we needed for our stay. This is the 5th home we have rented in wine country, and our favorite thus far. The pool/hot tub were great and we used them every afternoon. The house did not have AC, however when we opened all the windows at night, it cooled down significantly. We were lucky to miss the extreme heat during our trip. The home is walking distance to a few wineries, which was nice to have. Wonderful stay! We had a great long weekend at limerick lane with my parents and our infant daughter. The house is beautiful and very well maintained. It is an ideal location very close to Healdsburg. The property management team were helpful and responsive. We hope to return soon! The house was impeccable and comfortable. The pool area was just perfect and what we needed for a relaxing family stay. This house is amazing and figuring out when I can come back! Very good experience. However, the house had radiant in-floor heating with the thermostat set at 58. We had trouble figuring out how to increase the thermostat and there were instructions that it would take six hours for the house to reach the desired temperature. It would have been nice to have the house warm when we arrived. It was a cold and damp first night in the home. The most beautiful and serene place. So dreamy. We couldn't get enough of the views, the amenities, the privacy. Such a wonderful home and purely serenity for those who need a break. Loved our stay at this house. Very interesting modern farm house with high end finishes and amenities. Close to Healdsburg and wineries. Will stay here again. My wife and I took our 9 month old twins here for a long weekend and we wish we stayed longer! Great, modern eco-friendly home with a nice layout and perfect indoor/outdoor feeling. We loved the pool, patio, bocce ball, outdoor shower, and especially the sunsets - all of it!. You are super close to town too but you'll want to just relax aroudn this home mostly. Can't wait to go back. Our stay was perfect in every way. The house is beautiful, clean, comfortable and in a great location. The experience was true perfection and we cannot wait to come back! I did Ironman Santa Rosa and needed a place to stay with the whole family. This house was perfect and the kids (1.5 and 4.5) had a blast in the pool and outdoor area. The house is probably one of the best rentals we've ever stayed at. The kitchen and living room area was perfect for cooking and hanging out and the doors that opened up to the outdoor space made it even better. We had small issue with the fridge not staying cold and got someone on site to take a look at it immediately and it turned out to not be an issue after all the next day. We ended up spending most of our time at the property in the pool. Loved this house and would love to come back! Second time staying at Limerick and bringing the family. The set up is great and the kids especially loved the pool. Plan to come again soon.